Important note: the GTO-CP4 control box is not available ex stock, but can be ordered in a short time. If you're interested please inquire by mail or phone. Astro-Physics accessories: Further accessories can be found on our Astro-Physics price list, this will also be listed bit by bit. Contact us and we will gladly create an individual offer for your desired device. Backward Compatibility: All of this is in a compact size that fits all previous GTO mounts (400 GTO, 600 E, Mach 1, 900/1100/1200/1600 and 3600 GTO). Adapters may be required. If you have any further questions, please send us an email to kontakt (at) baader-planetarium.de or call us. 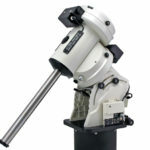 Detailed information about the Astro-Physics German Equatorial Mount are available here.